Tendulkar was supposed to lead parliamentary discussion on sport but stood in the House, waiting to speak as Congress party lawmakers created ruckus over Prime Minister Narendra Modi's comments. 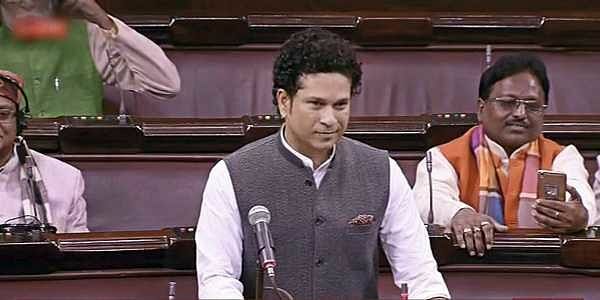 NEW DELHI: Cricket legend and nominated member of Rajya Sabha, Sachin Tendulkar was out for a duck in his maiden Rajya Sabha speech on Thursday. Tendulkar was supposed to lead parliamentary discussion on sport but stood in the House, waiting to speak as Congress party lawmakers created ruckus over Prime Minister Narendra Modi's comments on his predecessor Dr. Manmohan Singh during the Gujarat election campaign. Known as the 'God of Cricket', Tendulkar was nominated to Rajya Sabha in 2012. Often criticised for poor attendance in the Parliament, he had moved a Short Discussion Motion on the future of sports in India but the ruckus disrupted him from speaking on the crucial issues. Chairman of the House, Venkiah Naidu tried several times to pacify the shouting MPs, before adjourning the House for the day.